On this Earth Day, federal social media managers are hard at work, sharing and promoting what government and citizens can do to protect the environment. We’ve compiled a sample of the activities that also show how different agencies are using different social media tools in support of a common goal. Today, EPA has a splash page up replacing its home page for the day. It features the 12 tips that were shared, retweeted, etc. the most through April, rotating every hour through the day. EPA’s also using the splash page to launch a new widget that provides all the tips, changing daily. It allows anyone to share the tips on a Web page or blog. One of the most exciting activities has been the Thunderclap campaign to encourage others to take action. They far surpassed their goal of 500 supporters, getting 904 people to share their message with a combined following of 2.7 million people. Here’s what tweet streams looked like after the Thunderclap went off. 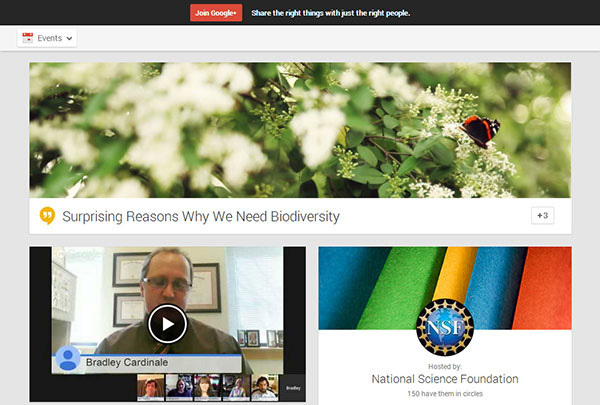 EPA has had support from a number of other federal agencies in promoting Earth Day, including the National Science Foundation (NSF)’s Google Hangout on biodiversity that discussed building robots representing various features of insects and other animals and citizen science getting involved in biodiversity issues. Participants could Tweet questions using the #NSFLive or via email. 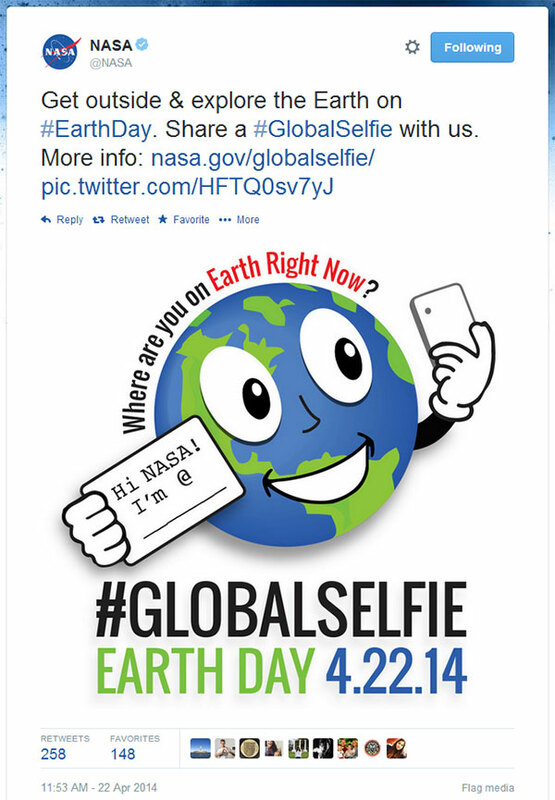 The National Aeronautics and Space Administration (NASA) is holding a #GlobalSelfie event where we are asking everyone to step outside, take a selfie, and post on Twitter, Instagram, Facebook, Google+ or Flickr. #GlobalSelfie will celebrate Earth Day and draw attention to NASA’s five Earth Science missions launching in 2014, as well as create a global portrait of the planet and the people on it, according to Susan Bell, Web Producer, NASA JPL (and creator of the #GlobalSelfie idea). The National Oceanic and Atmospheric Administration (NOAA) is using its Twitter, Facebook and Instagram feeds to promote the unveiling of its U.S. Postal Service (USPS) International Forever Stamp, says Genevieve Contey, deputy director/managing editor for the Digital Media branch of NOAA Communications & External Affairs. 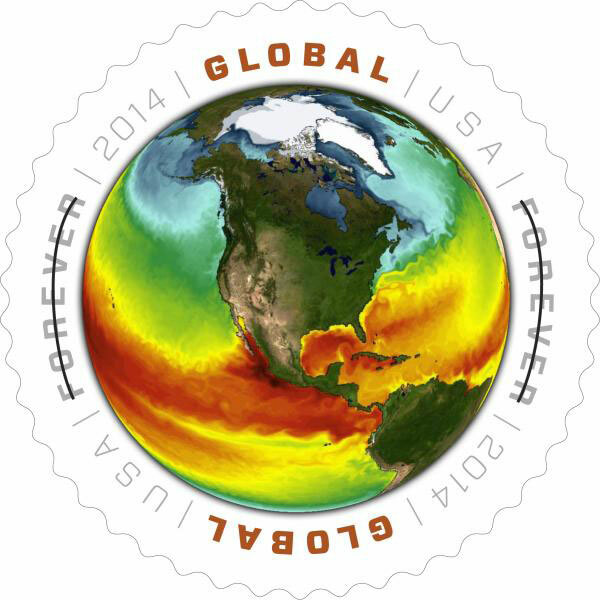 The stamp, that features a NOAA visual representation of the Earth’s sea surface temperatures, allows NOAA to demonstrate the agency’s role in providing environmental intelligence. The image came from an animation created from the output of a computer model of Earth’s climate by NOAA’s Geophysical Fluid Dynamics Laboratory, with land color derived from a NASA satellite composite. 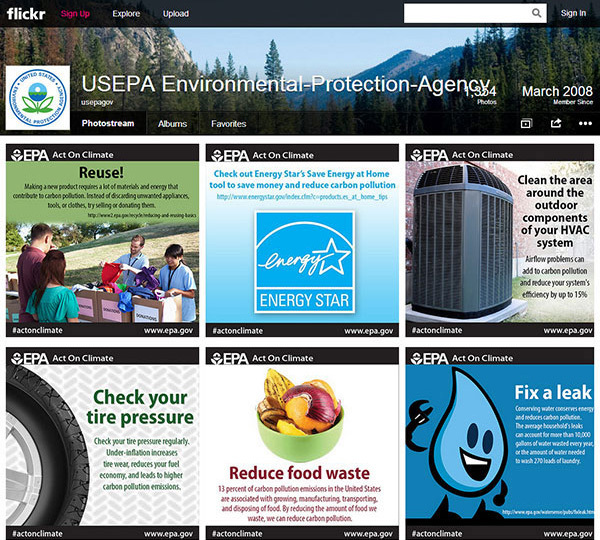 The General Services Administration (GSA) is taking to Pinterest to promote its Sustainable Facilities Tool, cross promoting government and industry Earth Day initiatives and offering actionable tips on how to take action in your office, says Michael Bloom, Sustainability and Green Building Program Advisor at GSA. 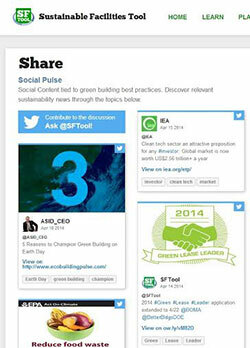 The Social Pulse captures and showcases green building and Earth Day trends from Twitter so you have everything you need, all in one place. 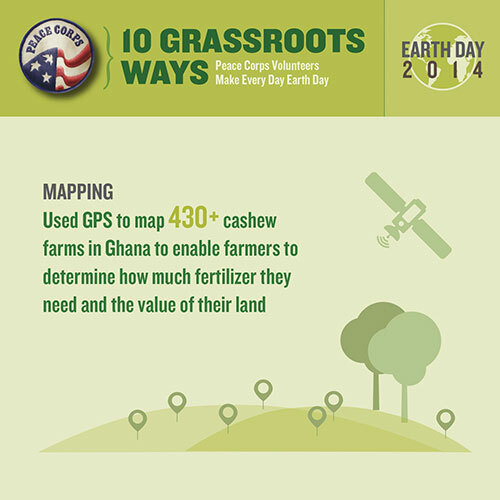 Peace Corps’ infographic on 10 grassroots ways Volunteers make every day Earth Day! The National Defense University is creating a Thunderclap campaign to share information about low-cost energy efficient technology solutions. 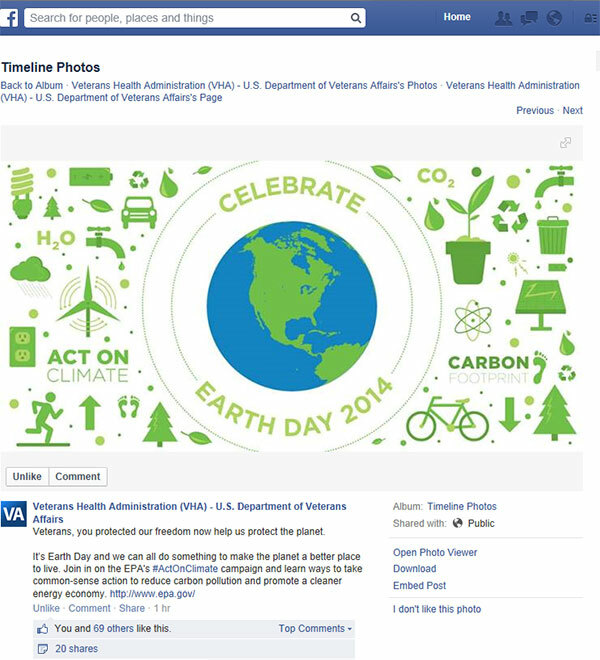 Veterans’ Health Administration’s Facebook post/graphic prompting Vets to help protect the planet and directing them to EPA’s Earth Day programs. The National Zoo’s #EndangeredSong for Sumatran tigers campaign. Office of Naval Research’s Asian Pacific Technology and Education Partnership’s YouTube video on alternative energy. The National Institutes of Health’s National Center for Complementary and Alternative Medicine is sharing an online Facebook Herb Search. These are just a few of the great activities happening today in digital government. We encourage you to share your favorites in the Comments section.